Twenty-seven years into the national charter school experiment, funding of charter schools and traditional public schools remains wildly unequal. In fact, charter school students receive 27 percent less in per-pupil funding than their traditional public school counterparts, leaving a total funding gap of nearly $13 billion. The sheer magnitude of this gap should alarm anyone who cares about equity, but it matters even more because most charters serve a higher proportion of students of color and low-income students than traditional public schools and show positive effects on the performance of these groups. When charters are underfunded, it is the students most in need of a quality education whose educational opportunities are limited. Charter schools are often critiqued for draining resources away from traditional public schools, but these data suggest that charter schools are doing more with less for students that are most in need of a high-quality education. Without action from state and local policy makers, charter schools will remained underfunded and charter school students will pay the cost. Read my full op-ed here. This entry was posted in Charter Schools and tagged charter laws, charter schools, School funding on April 17, 2019 by Brandon Lewis. Every day, nearly 500,000 school buses transport students to and from school in districts across the country. Many of these buses are older diesel models that release dangerous emissions, harming both the environment and student health. While cleaner and cheaper alternative fuels like propane, compressed natural gas (CNG), and electric exist, higher upfront costs prevent most districts from transitioning. The good news: there’s an increasingly popular financial tool out there that could solve this problem. Social Impact Bonds (SIBs) are typically used to finance programs that can generate both societal benefits and cost savings, particularly programs administered by nonprofit organizations and government entities. Under the SIB model, private investors provide initial capital in exchange for a return funded from eventual cost savings. Those investors, and not taxpayers, absorb the financial losses if these programs do not achieve projected savings. SIBs have been used to fund programs related to prisoner recidivism, high-quality preschool, and reducing common health hazards, with varying levels of success. As of 2016, nine SIBs operate in the United States, with 50 more in development, representing over $90 million in private investment. As we describe in our recent report, “Miles to Go: Bringing School Transportation into the 21st Century,” the benefits of switching to buses that run on alternative fuels are well-documented. And they cost less to run, benefiting district budgets. However, in contrast to the public transit sector, where more than one in three buses runs on alternative fuels or hybrid technology, uptake in the school transportation sector has been limited. Of all buses sold in the U.S. and Canada in 2014, only six percent were alternatively fueled. In 2012, that figure was less than three percent. This is largely due to the additional costs associated with shifting away from diesel. Propane buses cost about five percent more than their diesel counterparts; that figure is 25 percent for buses run on compressed natural gas. Electric buses, which offer the most cost savings and environmental benefit, are more expensive still — often costing an additional $100,000 to $120,000 more than diesel buses. Transitioning to these buses may also require infrastructure expenditures in the form of fueling and charging stations. For example, case studies from the Department of Energy estimate that installing a propane fueling station costs between $55,000 and $250,000, depending on the station’s size and equipment. This is where SIBs can help. For SIBs to work, projects have to attract investors by demonstrating the potential for a return on investment. A number of case studies have provided evidence of the potential cost savings of switching to alternatively fueled buses, savings sufficient to offset the higher upfront cost. A 2014 report from the U.S. Department of Energy’s Argonne National Laboratory found savings of between $400 and $3,000 per bus per year associated with replacing diesel with propane, with the incremental costs of the vehicles and related infrastructure being offset over a period of three to eight years. And researchers from the University of Delaware have shown that using an electric school bus instead of a diesel bus could save a district roughly $230,000 per bus over a 14-year lifespan, with the initial investment being recovered after five years. Alternatively fueled buses are cheaper to fuel, operate, and maintain than diesel buses. Alternative fuels cost less than diesel, and their prices remain relatively stable compared to diesel, which varies with the fluctuation of crude oil prices. There are also a variety of savings from maintenance costs. These buses use less oil and cheaper filters, and unlike their diesel counterparts, they do not require additional treatment to meet federal vehicle emissions standards, potentially saving thousands of dollars in maintenance each year. Electric buses that use vehicle-to-grid technology — which allows vehicles to communicate and interact with the overall power grid, rather than just draw a charge from it — can even become “prosumers,” meaning they return energy to the grid. The energy stored in the buses’ batteries can be tapped to lower a facility’s electricity bill. SIBs are not without criticism: they may limit the savings that governments could reap from traditional means of public investment. This is the other side of the equation when privatizing potential risk: governments also privatize some of the reward. However, to date, most districts have not been able to invest the initial capital needed to replace their diesel fleets. 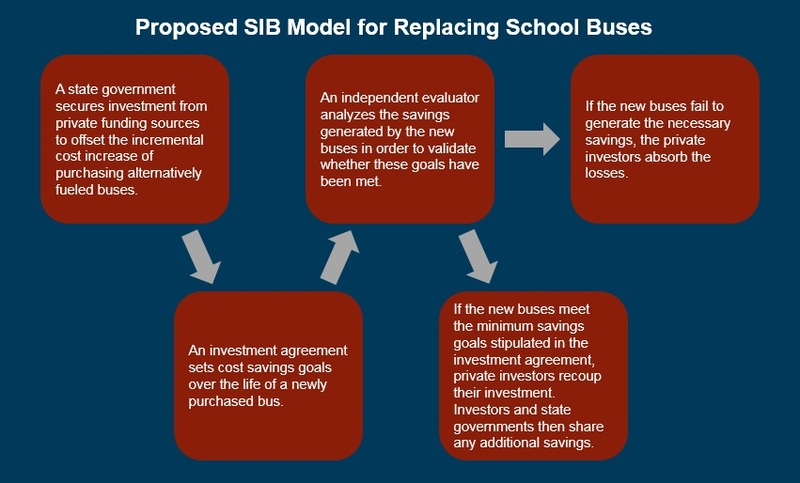 Implementing a SIB model could help speed up this process without further draining district budgets. Such a program would not only benefit the environment: districts could also reinvest the savings to improve other aspects of their school transportation systems, or funnel those dollars back into classrooms. It could be a win-win. This entry was posted in Education Innovation, Education Policy, Education Technology, School Funding, State Education Policy and tagged clean energy, diesel, Funding, natural gas, school bus, school finance, School funding, SIBs, social impact bonds, US Department of Energy on May 16, 2017 by Phillip Burgoyne-Allen and Jennifer Schiess. Could Potential Trump Education Plan Make Inequality Greater Again? When it comes to education policy, Donald Trump’s positions are largely a mystery. But here is what we know so far: he hates the Common Core, and he regularly flirts with the idea of eliminating the U.S. Department of Education. There. That’s the whole of Trump’s plan to make American Education Great Again. Unfortunately for The Donald, improving America’s schools will be far more complicated than eliminating high-quality standards state-by-state and downsizing a federal bureaucracy. Yet, what Donald Trump lacks in experience or expertise, he more than compensates, he claims, by hiring the very best people. Enter New Jersey Governor Chris Christie, one of the favorites to be Trump’s running mate, and whose education policies would be a terrible national model for a Trump Administration to pick up. As troubling as that comment is, Governor Christie’s latest idea — so called school “Funding Fairness” — is particularly odious. At first glance, the proposal could be attractive: ensuring all students receive the same baseline level of state funding. In practice, however, this new funding model would amount to taking millions of dollars from school districts with highly concentrated student poverty, and redistributing those funds across more affluent districts. As a result, many urban, high-poverty districts could lose millions. In other words, Governor Christie’s big idea to make public education great in New Jersey is to take millions of dollars from students in need, and give them to students who are better off. That idea is completely backward and unfair. This entry was posted in Education Policy, Equity, Federal Education Policy, Politics of Education, School Funding, Uncategorized and tagged Chris Christie, Donald Trump, Education equity, ESEA, School funding, Title I on July 7, 2016 by Max Marchitello.